Social networks are probably part of your marketing strategy (if not, they should be!). Facebook, Youtube, Twitter and LinkedIn are four of the most visited websites in the world and you need to be able to properly track your social media performance. DashThis makes it easy: just link your reporting tools and we'll do the rest. When you're running campaigns on different social media platforms it can be a pain to track campaign performance through the individual social platforms. We've solved that problem: with DashThis, all of your social media data will be in one convenient dashboard. All you have to do is link your reporting tools. It's essential for you to track your social marketing efforts. 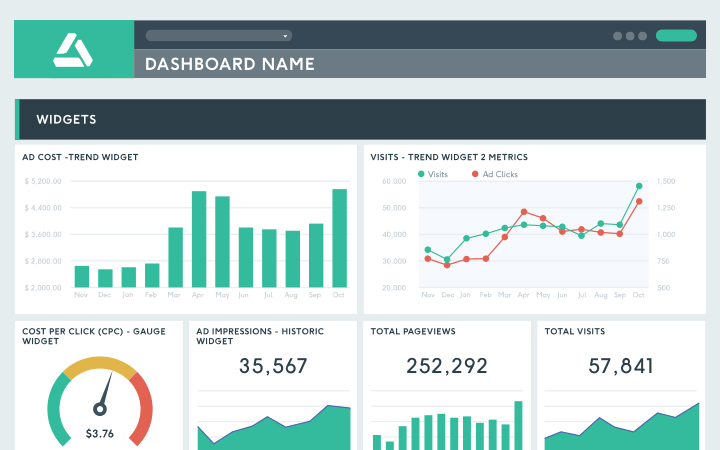 Easily track your KPIs in real-time from engagement metrics to impressions to reach to followers and everything in between. Whether you want to use our preset widgets or our custom widgets, you'll have everything you need to see all your social media reporting metrics in one place! Add your own logo, comments, merge data into a single widget... Whether you start with our preset social media dashboard template or create your own from scratch, you can customize almost everything from the dashboard level to the widget level. Show your social data the way you want! Combine all your data from Youtube, Twitter analytics, Instagram analytics, Facebook Insights or your other social media management tools into one social media analytics report. You can also link your other digital marketing tools like Google Analytics to generate a comprehensive online marketing report. And, if you have custom data from a tool like Snapchat, Pinterest analytics, Sprout Social, Quintly, Keyhole, or Hootsuite, you can just upload a CSV file. Social media monitoring is important because it shows you what's working and what you might need to tweak across your social channels so you can create the right type of content. These agencies - along with many others - use DashThis to create social media reports, saving them time and money. We think we've got one of the best social media analytics tools around - but don't just take our word for. Our goal is to ensure that your social media dashboard creation process is as simple as possible, while still offering you all the features you need. All the benefits of a customizable tool, without the hassle of needing an IT specialist to help you with the process! What's more, customer service is our number one priority so you'll even get your own account manager to help you out if you need it. Pretty sweet, right? Think about how much time (and money) it takes your team to produce your social media reports. Imagine saving that time and money instead. Well, that's what WE do! With the extra time, your team can add even more value to client projects, which means bigger profits! More time and bigger profits? We'd call that a win. And with our first-rate customer service, you aren't just getting social media reporting software, you're getting peace of mind! Save on a custom URL and design with a white label bundle that includes both! A social media report just the way you want! Monitor everything from Facebook pages to Instagram insights. Our social media report template has everything you need to get started quickly: it’s pre-built with the standard social media KPIs you need, and it’s fully customizable so that you can visualize the data you want, the way you want.